So Zak did one of these animal variety posts about dogs, and Chris did one about horses. 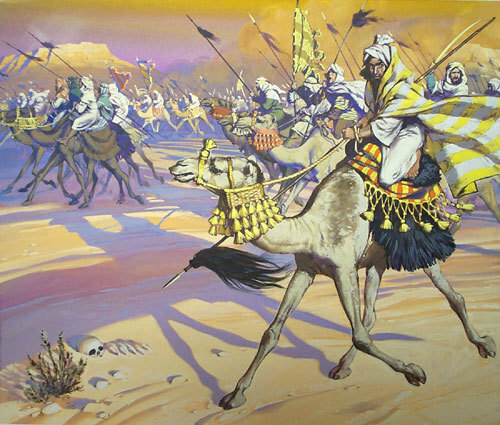 At Scrap Princess's suggestion/command, I'm going to do one about camels. Your basic camel in Legacy of the Bieth is a dromedary, or single-humped camel. They are a 3 HD creature that has MV 21 - faster than a medium or heavy warhorse, but slower than a light warhorse or riding horse. They can carry about as much as a medium warhorse (whatever amount that is). They can average about 1.5 times the overland speed of horses when trying to cross rough terrain (less need for foraging, greater endurance), but aren't as great in combat - they're far less obedient and more likely to try and get out of dodge. They will also engage in wacky hijinks far more than horses, and will spit in your face on occasion if they are ornery. Horses within 20' of camels are generally spooked and will have a -2 penalty to their morale. So now you're all educated about camels, great, how much do they cost and what cool ones can you get? Well, let's say that they cost 110 gp - between a light warhorse and a riding horse. Use the "purchasing" and "mount quality" tables from the Hill Cantons post on horses (linked again here). There is a 15% chance that an unusual type of camel is available. If so, roll on this table to see what the camel is like. 01: White Camel Snow-white camel, not the cream color that most are. Beloved of certain nomad tribes, and considered to be almost sanctified. Riders of white camels will get bonuses to reactions with said tribes...unless they are mistreating the camel, in which case it will likely be liberated from its cruel owner. Base price 3x normal - but priceless to said tribes. Has an unexplained fondness for bananas. 02: Wrestling Camel: Bad tempered, but can strike in melee for d4/d4 as it bites and stomps and is generally ornery. Uses its neck to knock targets down. 03: Bactrian Camel: AKA the two-humped fuzzy one. What the heck is it doing here? Regardless it has a large carrying capacity, about that of a draft horse. MV 18, though. It's also far more prone to spitting (50% chance to spit at random target during combat, save or be blinded for d3 rounds). Base price 120 gp. 04: Crooked Hump Even though it's not your fault and is in fact a perfectly natural occurrence, everyone sees the crooked hump of your camel and assumes you've been doing a crappy job taking care of it. Lots of unsolicited advice. 75% base price. 05: Camelopard Spots like a leopard. Purrs once in a while, and my those teeth do look kind of sharp. Has two backwards curving horns which could do d6 damage. 150% base price. 06: Firebreather MV 22, occasionally breaths fire in a 5' cone for d4 points of damage. Puffs of smoke occasionally rise from nostrils. Answers to "Joe." 07: Symbiotic Camel: The camel can provide its rider with some of its vitality while the rider sits atop its hump. No need for rations or water! After d6 months, the rider starts growing coarse hair all over their body, avoiding meat, and their eyes shift a bit towards the sides of their head. At this point they can't leave the camel's side for more than d6 days or else they'll start to weaken. If the camel dies, they die. 08: Black Camel: Favored by poets and angsty teenagers. Viewed as a sign of ill omen, but anyone attacking the rider has a -1 to hit and damage. 09: Red Ghost Camel: Blood red fur. Can only carry one rider ever. If they die, the camel will keep them upon their back and go on a murderous rampage. When rampaging, treat as a 5 HD monster, d10 damage with hooves, and it becomes omnivorous. 10: Water Hump: This is the one which made all of the legends. It actually stores water in its hump rather than fat. Very hard to ride, but you can slit open the hump and siphon water out if you need to. Of course the camel will likely object to this. 11: Magic Eater: Somehow this camel is immune to magic and mutation. Will calmly chew down on strange anomalies. Of course, if magic is causing something else to do damage (rock dropped on head), then the camel is going to be sad. Oh, and predators find these critters incredibly tasty. 100x base price. 12: Nourishing Camel: Camel mare. A cup of its fresh milk can serve as a healing potion for d6 points, but after taking d4 doses, you start to develop a tolerance to it and it will only heal 1 point of damage. 20x base price. 13: Allocamelus: Body of a donkey, head of a camel. Stats and price as a donkey, but moves through desert as a camel. 14: Acid Spit Camel: Can be coaxed to spit its strangely acidic cud at enemies. If it hits, deals d4 damage and blinds the opponent for d4 rounds. Camel can spit once every 8 hours. 15: Racing Camel This one has MV 25, but is far more prone to injury and needs rest more often. (Sprints, not long hauls.) Reduce overland speed to horse speeds. Everyone comments on what a graceful and beautiful camel you have. It knows it and acts like a total prima donna. Base price 2x normal. 16: Camel...spider? Has eight legs; positioned more like a spider than Sleipneir. MV 30, but people think that it's damn freaky. I can't imagine why. Horses are even more agitated around the spider camel and I don't blame 'em. 17: Dancing Camel Occasionally stops and starts rocking out to music only it can hear. Seeing the camel dancing has a 50% chance of breaking any compulsion or charm that an individual is under. Irrational dislike and distrust of any monkeys or apes. 18: Five-Legged Camel The fifth leg is located just behind the hump and curves upwards like a scorpion's tail. Generally doesn't hit the rider in the head too much. Can strike for d8 damage in melee. 19: War Camel This one's been trained, somehow, for obedience and combat. 3+3 HD, less likely to try and run in combat, and will protect its rider if they fall, attacks for d6/d6 dmg. Base price 350 gp. 20: That's no camel, that's a space bantha! 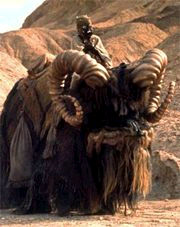 Somehow the camel salesman has a bantha. Big, fuzzy, giant horns. Treat as a heavy warhorse that can move through badlands at camel speeds. Deals d8 damage with its horns. Base price 600 gp. Tusken Raider costume does not come with bantha. So awesome. I love the dancing camel , and the racing camel, and the donkey camel. Must get players to desert now, so camels. 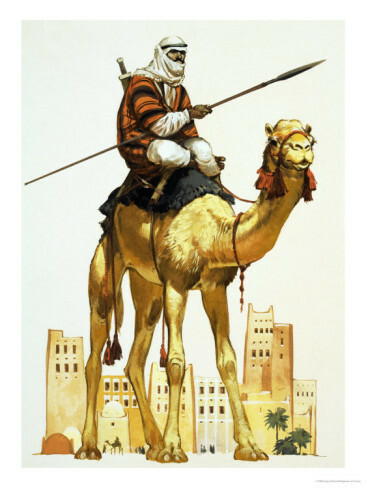 BTW, the semi-standard unit of merchandise around Cairo in the 12th century was one camel load (according to the Cairo Geniza documents, via S. Goitein) and it could weigh half a ton! I'm pretty sure that's more than a medium warhorse could handle - at least for any length of time. Thanks! The dancing camel is getting a lot of love. Yeah, it does seem likely that the actual camel weight capacity would be higher and the speed lower perhaps. I think I'll keep it at the medium warhorse for simplicity's sake right now, and reevaluate it when I have a chance to sit down and poke at things. I've been meaning for the past year to compile what they say about sea travel into a single post, dammit, because I know there would be interest, but somehow... maybe next year.